Installing cleats on your bike shoes is generally a straightforward process, but it can be helpful to keep a few things in mind while you're working. You'll need an allen wrench and some grease. Make sure you follow the directions included with the cleats regarding any washers, spacers, or adapters. Then simply grease up a bolt and slowly thread it into the shoe. Work slowly and ensure that the bolt threads in properly! 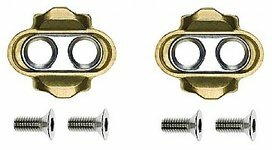 A cross-threaded bolt can result in a stripped-out anchor, which is a hassle to repair. Take care not to overtighten the cleats. 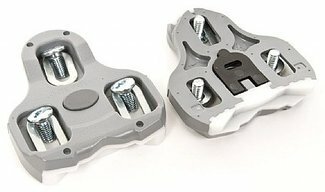 Again, the bolt anchors in the shoe can easily be stripped. Once the bolts start to tighten, slowly finish them off. Check recommended torque settings for your specific shoes and pedals. Position the center cleat mark slightly behind the widest point of your foot. Gently tighten all the cleat bolts, but not all the way. Check the cleat position by clipping into your pedals. The pedal axle should be slightly behind the ball of your foot. Secure the pedal bolts. Tight, but not too tight! Most riders position their cleats directly beneath or slightly behind the ball of the foot. Pushing the cleat further back is thought to put less stress on your calf muscles, which don't do a lot to enhance a normal pedal stroke, but can weaken your stroke when fatigued. True pure sprinters—think track match sprint riders, not Tour de France sprinters—may be the only group of cyclists that push their cleats farther forward. There is little solid evidence that this is beneficial, but it gives a more explosive feel. It is worth noting that track events never go uphill, and are very short compared to road riding. Most riders never deviate from the neutral cleat position described above. Those who experience knee, hip, or back problems or have differences in leg length may want to consider a professional bike fit. A fit conducted by by a certified fitter with a background in biomechanics may be the only way to address specific position issues. Self-diagnosis and tips from well meaning riding buddies can do more harm than good. For any questions regarding cleat installation or compatibility, contact us at 1-800-682-0570 or [email protected].